This blog is about the history and evolution of the British experiment with more medium-term public spending plans and performance oriented government. From 1997, the New Labour government tried to adopt a more strategic approach towards public spending – embodied in the ‘Spending Reviews’. These were meant to fix Departmental Expenditure Limits (DEL) for three years in advance and the first review was published in 1998. 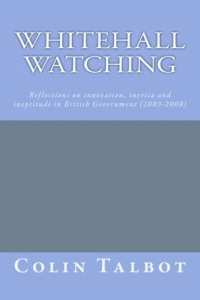 Further reviews followed in 2000, 2002, 2004 and 2007. The idea of Spending Reviews has now taken root in the British system, with the new Conservative-Liberal Democratic coalition government adopted and even extending the spending review idea, with a plan covering four years announced in October 2010. The more strategic approach under New Labour did not just involve spending, but also trying to specify what was to be delivered for that spending. These took the form of ‘Public Service Agreements’ (PSAs). PSAs accompanied each of the Spending Reviews and set out what government departments were expected to achieve. Although PSAs have now been abandoned by the new Coalition government, it was clearly an important initiative. There were many changes in British government that flowed from, and paralleled, the whole Spending Review-PSA reforms. I – Colin Talbot – am currently writing a book about this whole experience. I am also teaching a group of students at Manchester Business School on this topic. This blog is meant to help both me and them by developing the history of Spending Reviews as well as observing how SRs continue to evolve under the new government. What I will be posting on the blog will be closely linked to the course I’m teaching, but hopefully will also develop the history of ‘Strategy and Delivery in Government‘ in the process. I hope that my students and others, including some of those I’m interviewing for the book, will contribute to this project by making comments on my posts. It might even develop into a useful resource for others interested in this topic – as I know many governments around the world have folowed British developments with interest.